I don’t knit for myself very often. I always have approximately a million of ideas of things that I’d like to make for other people, but inspiration often fails me when I turn my attention to something I might want. But over the Christmas holidays, after the main celebrations, I finally had a chance to sit down, binge some Netflix (loved the first season of The Punisher and the latest season of Black Mirror, in addition to the 7 Sisters movie), and knit a few things for myself. First, I wanted to use up the odds and ends of Bernat Handicrafter Cotton Yarn left over from making cloths throughout the fall. I made at least two dozen as gifts for friends, family, and my kids’ teachers. All of those ones had lovely, coordinating colours — leaving me to make ugly, mismatched cloths for myself. 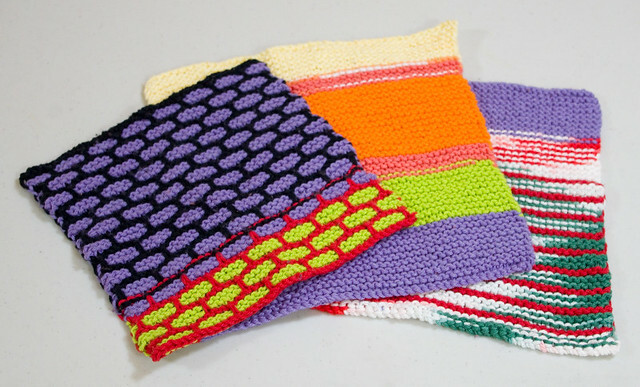 I thought I had enough Black Licorice and Hot Purple to make a Brick Stitch Dishcloth, but as you can see I ran short, so I just went with 45-stitch knit squares for the other ones. How they look doesn’t matter too much to me, though, since they’re just going to be used for cleaning up messes. The second thing I knit was a hat from the Red Heart Super Saver Stripes in Favorite Stripes that I got in my Christmas stocking. I thought that something especially warm was in order since we’ve been seeing record-setting cold here lately; New Year’s Eve it went down to –28.6°C (-19.5°F) before wind chill, the coldest it’s been in 71 years. 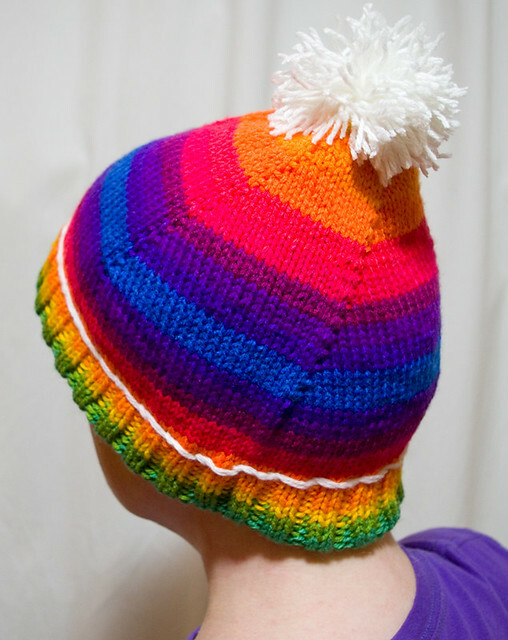 I whipped up double-layered rainbow tuque, using all but the last few meters of one ball of yarn. The hat is so thick and comfy that it muffles sound significantly when you put it on! I used some scraps of white yarn from my stash to make a pompom and to do the accent stitching. I finished it last night right before bed, and my timing couldn’t be better. The temperatures had dropped again from a relatively comfortable -5°C-ish (23°F-ish) during the day to a nighttime temperature of -20°C (-4°F), -32°C (-25.6°F) with the windchill. This is the kind of weather where the air hurts your face as soon as you walk outside, so anything to help prevent frostbite is a plus. Posted on January 5, 2018 January 23, 2018 by owntwohandsblogPosted in KnittingTagged acrylic, beanie, cloths, colour, cotton, dishcloths, handicrafts, handmade, hat, Knitting, rainbow, stripes, toque, tuque. I love these patterns and my Bloke loves the colours. Well done – so beautiful. Have a wonderful day!